Throughout his career, Cal Ripken Jr. was one of the games most respected players. Wherever he played, fans adored him. His hard work, leadership and great play made him an example for all of his peers. 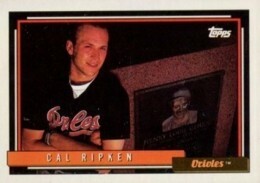 Not surprisingly, Cal Ripken Jr. cards were and are among the most collected in the hobby. 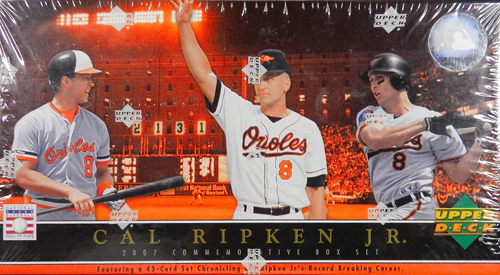 Check out our comprehensive Cal Ripken Jr. cards and memorabilia guide. Ripken is most remembered for his consecutive games streak of 2,632 game spread over 17 years. Even without The Streak, he would have been a first-ballot Hall of Famer. He was a two-time American League MVP, 19-time All-Star and World Series Champion. Ripken finished his career with 3,184 hits including 431 home runs. From a value standpoint, Cal Ripken Jr. is the standard of his generation. His only rival in this department might be Ken Griffey Jr. But many will likely view the pair from separate generations. Ripken's prime coincided with the hobby's Junk Wax Era and the mid-90s insert boom. While the shortstop has certified autographs dating back to 1992, most of his signed cards have been released following his retirement. Below, we've compiled a list of ten of the best Cal Ripken Jr. cards ever made. With literally thousands to choose from, not everyone will agree as everyone has different criteria for what makes a classic card. We looked for cards that were iconic, stand out, have strong value and have withstood the test of time. 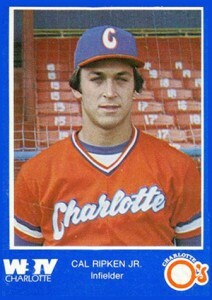 1980 Charlotte O's Police Cal Ripken Jr. Handed out by local law enforcement, the 1980 Charlotte O's Police Cal Ripken Jr. is one of the most coveted minor league issues of all-time. According to Ripken in the Minors, the card was given to children when officers went to speak at schools. Ripken was one of 25 cards handed out randomly. Rare to begin with, it's also extremely prone to damage. As a result, prices pop whenever one of the 1980 Charlotte O's Police Cal Ripken Jr. cards surface, no matter the condition. 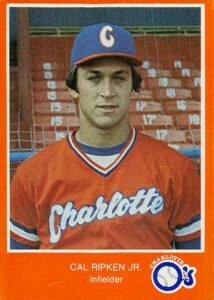 1980 Charlotte O's WBTV Cal Ripken Jr. Featuring a near identical design to the police issue, the 1980 Charlotte O's WBTV Cal Ripken Jr. was part of a team set that was given out at the ballpark. A total of 1,400 sets were produced. Unlike the orange-bordered card, the WBTV Ripken has biographical information on the back. Unfortunately, the his last name is misspelled as "Ripkin." Because the 1980 Charlotte O's WBTV Cal Ripken Jr. is so valuable and it was made with minimal technology, it is prone to counterfeiting. Here's an article on spotting fakes. The vast majority of Cal Ripken Jr. cards show the Hall of Famer looking like he loves to play baseball. The folks at Donruss must have caught him on a rough day for his rookie card photo shoot. 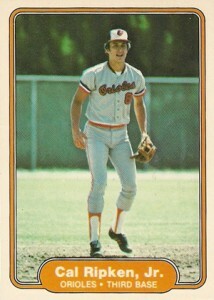 Even still, a Cal Ripken Jr. rookie card is a Cal Ripken Jr. rookie card, no matter the pose or face. Like his other two official rookie cards, there is no shortage of 1982 Donruss Cal Ripken Jr. cards. Ripken is almost swallowed up by the background on his 1982 Fleer rookie card. Like its Donruss counterpart, this one falls under the "Rookie Card of an All-Time Great Rule." Who's going to turn down a Ripken rookie? Not many. Topps took a break from making multi-player rookie cards in 1983. For many, that was a year too late. 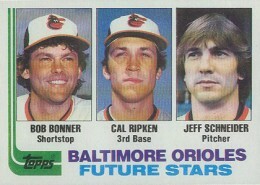 So for his Topps rookie card, Ripken is sandwiched between two guys who played 72 games combined. 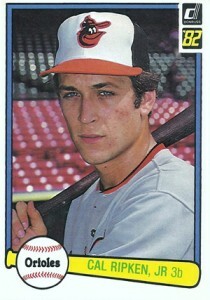 Still, the 1982 Topps Cal Ripken Jr. rookie card remains one of the most popular cards of the decade. 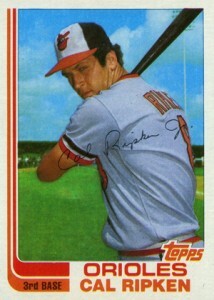 1982 Topps Traded Cal Ripken Jr. Although the flagship card carries the rookie tag, the 1982 Topps Traded Cal Ripken Jr. is the more desirable and much more valuable. Why? The Ironman is pictured by himself in an iconic pose on a card that is much more rare than his three rookie cards. 1982 Topps Traded was distributed as a box set and only through hobby dealers. In 1992, cards numbered to 10,000 were rare. 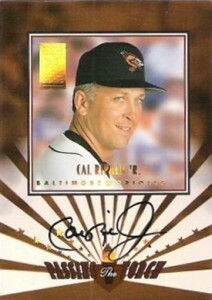 That must've made the 1992 Donruss Elite Signature Series Cal Ripken Jr. autograph a holy grail. Numbered to 5000, the card is the first certified autograph card from the Ironman. With the obscene print runs of the early-90s, this card remains relatively rare and popular. 1993 Topps Finest Baseball is one of the most popular sets of the modern era. It brought chromium to the forefront and the hobby hasn't turned back. The set also introduced collectors to the Refractor, a staple that remains today. Along with Griffey and Nolan Ryan, the 1993 Topps Finest Refractor Cal Ripken Jr. is one of the most valuable in this important set. Donruss Elite Passing the Torch dual autographs have long been one of the brand's trademarks. While there have been lots of great signature combinations, Passing the Torch usually had some of the strongest. Often a dual autograph with an A-list signer is brought down a notch by the less-desirable second signer. That's not the case here. In 1997, the first 150 of the 1,500 serial-numbered sets came autographed. Ripken was paired with another all-time great, Alex Rodriguez. At the time, Ripken was entering the twilight of his career and Rodriguez was hitting his stride. Even with A-Rod's decreased love in the hobby in recent years, this is still one of the best autographs of the 1990s. In recent years, massive patch cards have become something of an expectation. While they're gorgeous and tough to come by, many fail to reach iconic status. However, 2005 Upper Deck Sweet Spot Classics Classic Patch cards transcended that. They offered jumbo patch swatches when they weren't in as many sets. Limited to 34 copies, the patch is bigger than Ripken's picture. The striped design of the card also helps the swatch pop. So it's not the most valuable card, but do they all have to be? 1992 Topps Baseball has a beautiful shot of Ripken sitting next to the Lou Gehrig monument in Yankee Stadium, looking as classy as ever. The horizontal layout and slightly raised angle take it to another level. In 2007, Upper Deck released a 45-card set honoring baseball's Ironman. The cards have a moderately high-end glossy feel. The checklist is broken down in three subsets. The first looks at Ripken's early career. This is followed by key moments in the consecutive games streak. Finally, 15 of Ripken's peers offer quotes on the all-time great. 2016 Topps Throwback Thursday #TBT Online Exclusive Base #72 Cal Ripken Jr Jr. 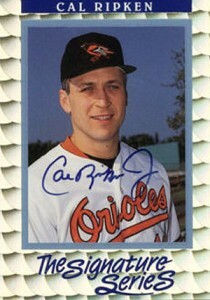 I cant find a cal ripken 2,000 consecutive autographes card. Game 490, oakland, score 10 to 1 win date 6/2 1985. The value. I you help. I found a 1990 Leaf, Inc, Cal Ripken, Jr baseball card in perfect condition. Any idea of the value? Marcy � Unfortunately, probably less than a dollar. I have a photo of Cal Ripken Jr batting left handed. Would it be worth anything? I have a photo of Cal Ripken Jr, batting left handed, would it be worth anything? I have Cal Ripken, Jr 23 Karat All Gold foil Sculptured trading card. Its a commemorative Issue. Any idea of what the cards value may be? There’s an ultra rare CAL RIPKEN JR MVP Double-Sided RED/RED 1990 Donruss Test Card Aqueous Series listed on eBay. More rare than the Aqueous Test and Blue/White Test. samiam248071@yahoo.com for more info. Tim � It sounds like a serial number but not having more details, it’s tough to say for certain. Is there another number on the card (3/5 may reference a checklist number if there isn’t)? Is the 3/5 in foil? That would be an indicator of a serial number for the card, which would mean the third of five total copies of that particular card. Yeah…it’s in foil on the back about 5/6ths of the way down…I see the card being sold online, but none I’ve found signify any kind of numbering. Though I haven’t really been collecting actively since serial numbers became popular, it looks like it is to read “3 out of 5” as you suggested. It happened to be in a box of older cards I bought at a yard sale. Any cards I’ve ever seen with serial numbers are much much higher (1,000 or more usually). If only 5 were made, did I hit a gold mine? Tim � Definitely sounds like a card that’s limited to 5. Congrats! Also, the number “4” is at the top of the back. I believe that’s the card number, I think. Thanks for the help. One more question for you if you don’t mind…I think I now see the same card online for sale, but it is advertised as “49/50”. (The picture shows the front of card, not the back, so I can’t see the serial numbering). Is it possible or likely that there could be 2 sets of serial numbers on the same card? (like one ‘set’ to 5 and one ‘set’ to 50). Tim � A lot of sets have multiple levels of parallels, usually with subtle differences like border colors or font colors. Most come with differing rarities as well. Cal sr., Cal jr., and Billy on the cover. What makes it special is that all three signed the cover. Any value for this? The magazine is well kept in a special frame with uv protected glass and can be removed for viewing. A few yrs back I found a 1 of 1 card when he broke the record,riding on the back of a red corvette.He rode around Camden Yard and has his signature in Gold writting.Its a 1995-96 Pinnecle.What is it worth so I can have it graded and sealed?Thank you. I have a 2005 classic moments Cal Ripken Jr that is autographed I am unsure the value or how many were printed. I have been unable to find any real information on it. any help? 2000 Spx certified autograph cal rypken card #1 of 5. 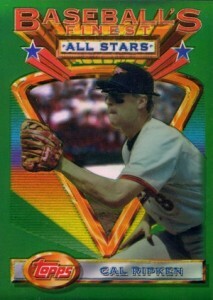 I had a redemption card for randy Johnson, it never showed. About a year later this card showed up in my mail. Anyone know any details or value of this card? I have the WBTV blue-bordered card in good shape, if anyone is interested in purchasing.. Remember pulling the 1992 Topps Ripken in gold (which were one per box back then, super rare). It’s the most valuable card from my childhood collection, goes for about $7 on the ebay. I have a 1992 Cal Ripken Grand/Slam limited edition collector series Holographic card, which i am unable to find any information on this card.Would there be any info on this card. To whomever may be concerned: I am in the process of cataloging 50 boxes of sports cards (with more to come) and just finished sorting them by sport (believe it or not, they were all discombobulated, but in their boxes). I have three of the same card, which I cannot seem to find a comparison for, anywhere over the internet. They were published by Upper Deck in 1996 and show a young Cal Ripken, Jr. (although not his rookie), circa 1983, catching a ground ball. The Baltimore Orioles logo appears on the lower right corner of the front of the card, with a border above his name. All of them are numbered “17 of 22” on the back, with a short career bio printed beneath a small oval picture of Ripken, on the back. If anyone can let me know if there is a comparison for these cards, each is in a plastic sleeve and in Mint condition. P.S. Is there any way to upload a pic of one of the cards (since they’re all exactly alike), so you will be able to see better which card I am referring to? If you email an image to trey@cardboardconnection.com, I will take a look.